I can't tell what kind of sparrow this is but he watched me take his picture then he jumped back in the brush and disappeared. Temp started at 44, ended at 59. Overcast then sunny. Steady 10-15 mph SW wind. First hike of 2019 and first hike in new Columbia hiking boots. Beginning mileage = 2324.5 miles with 295 logged entries. An overcast, windy, cold day on wet and muddy trails. 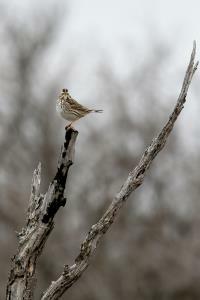 The weather conditions kept the wildlife hidden with the exception of a few birds. Most stayed low to the ground but there were two American Kestrels and two Loggerhead Shrikes hunting. All the other birds stayed in place or made short flights, low to the ground. Trails are easy to see and traverse and the park personnel have groomed the Roadrunner Loop again. It has been leveled and widened making it an easy hike for anyone. A bag of trash was picked up but nothing else to report. Water, shade, info kiosk, toilets and a bicycle repair station available at Playground parking area. Water, shade and toilets available at the mid-point of Roadrunner Loop. Water and shade available at various campsites along the edges of Roadrunner Loop. IMPORTANT - trail maps have been updated BUT the maps in the info kiosks have not. Trust the paper trail map you get at the park entrance.